Two years after the release of the band's self-titled debut album Svartanatt returns. 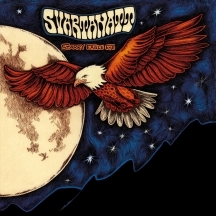 With a classic rock sound that catches the spirit of the late 60´s and early 70´s rock scene Svartanatt have gained many followers all over the world. Their new album "Starry Eagle Eye" is set for release the 2nd of March 2018 on the Sign Records. The album is built upon the same components as their debut but sees the band add depth to their songwriting. Songs as "Duffer" shows a more progressive side of the band while ballades as "Wolf Blues" and "Universe of" shows that the band has a more dreamy and psychedelic side with strong hooks. The album is in all filled up with straightforward timeless rock music. Starry Eagle Eye is recorded in Soundtrade Studios by Emil Drougge. The production of the album is both raw and honest and at the same time as it is crisp, dreamy and thoughtful. With skilled musicians and a classic rock line up of guitar, bass, drums, and organ the band manage to create a freedom and joy in the music that has become rare in recent days. The production leaves a lot of space to each one of the musicians and shows a band who just started their career. Svartanatt shows that rock n roll is all but dead.